There is an inherent weakness in all traditional inward opening timber doors. The Kickstop range was devised by a family firm of locksmiths and security retailers in East London. 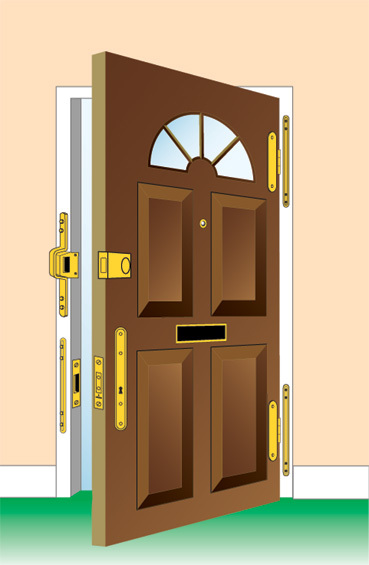 Concerned about the growing trend for burglars to simply kick in a front or back door, they were all too aware that a door will split open along the grain much more easily after the door had been weakened as a result of morticing and lock fitting. The strength or a good quality mortice lock is not in question but please remember, it's the door and frame that would split open and fail during a forced entry. The door - around the mortice deadlock or sashlock. The frame - around the mortice lock striking plate. The frame and door - around the hinge. The rim lock staple itself. Kickstop has developed products to deal with these security issues.